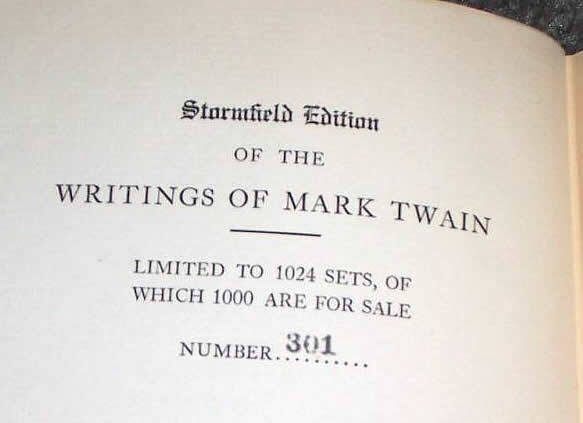 For the reader who wants a full shelf of Twain to dip into at leisure there are the 1923 Definitive Edition and the 1929 Stormfield Edition. 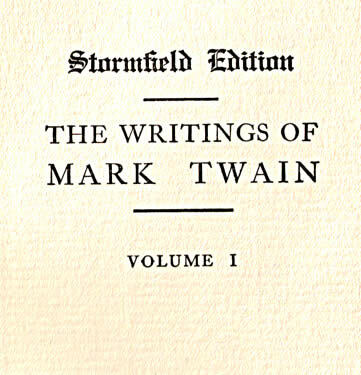 The Stormfield Edition is one of two uniform editions of Mark Twain's works published under the Harper and Brothers imprint in 1929 -- the other being the 1929 Memorial Edition. Printing codes for the volumes indicate they were printed in September 1929. It is the third uniform edition named after one of Mark Twain's residences. Stormfield, located in Redding, Connecticut was home to Samuel Clemens from June 1908 until he died in his bedroom there in April 1910. The Stormfield Edition is a 37-volume edition, limited to 1,024 sets, and contains almost identical content to the Gabriel Wells Definitive Edition of 1923, with some notable exceptions. The Stormfield Edition contains the Appreciations and Introductions that were unique to the Wells edition. However, as generally issued, the edition contains no autographed flyleaves by either Mark Twain or Albert Bigelow Paine. 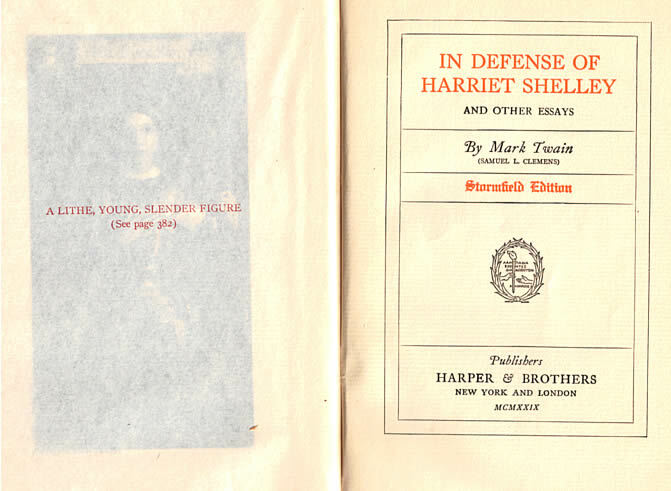 Volume 22 of the Stormfield Edition was renamed In Defense of Harriet Shelley, following a lead that had been established with Harper's 1923 Mississippi Edition. A number of volumes contain fewer illustrations than the same volumes in the Gabriel Wells Definitive Edition. The reduced number of illustrations renders any description of the two editions being identical in content as incorrect. Advertising and original pricing of the Stormfield Edition is lacking. This scarcity of publicity surrounding the edition leads to speculation that the edition was issued by a special arrangement with one or more particular book dealers for private sales or distribution. The volumes were issued in light blue dust jackets featuring paper labels on the spine. The binding is dark blue cloth with gold stamping on the spines that includes the identical monogram that was featured on the spine of the 1923 Mississippi Edition. 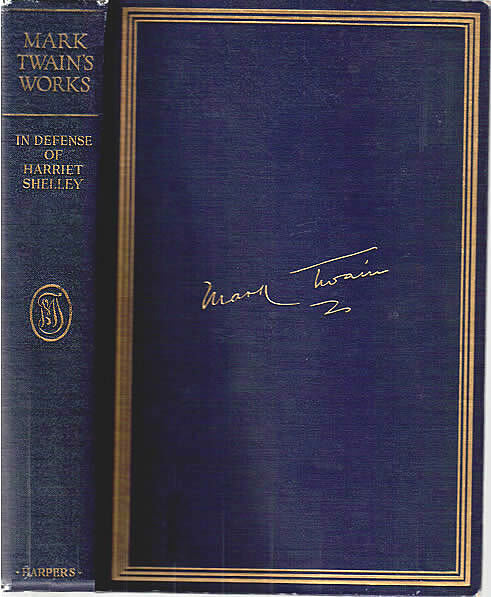 A gold stamped Mark Twain autograph surrounded by three ruled lines decorates the cover. Top edges are gilt and sides and bottoms are deckled. A separate page identifies the volume number although no volume numbers are present on the spine. The edition was limited in number to 1,024, the same number of sets included in the Gabriel Wells Definitive Edition. The number of the set is stamped in black ink in Volume 1. The first volume of the Stormfield Edition features the limitation statement and the number of the set. Volume 22 of the Stormfield Edition title page opposite a frontispiece covered by tissue. The 37 volumes in the Stormfield Edition feature illustrations that were also used in the Gabriel Wells Definitive Edition. However, the total number of illustrations have been reduced, probably in order to lower publishing costs. The textual content of the Stormfield Edition is identical to that of the Gabriel Wells Definitive Edition. Volume 22, previously titled Literary Essays, is renamed In Defense of Harriet Shelley. The Stormfield Edition, as generally issued, contains no original autographs or manuscript material. The set also contains fewer illustrations. On the positive side, the Stormfield Edition features cloth bindings and gold stamping that have endured the test of time better than the common blue cloth and tan board bindings of the Gabriel Wells set.